Before Memorial Day weekend, I was a novice when it came to sand dunes. I had seen the towering dunes along the Pacific coast of Oregon from Highway 101 when Jon and I drove the Pacific Coast Highway back in October, but up to that point I hadn’t touched one, and that’s what counts. 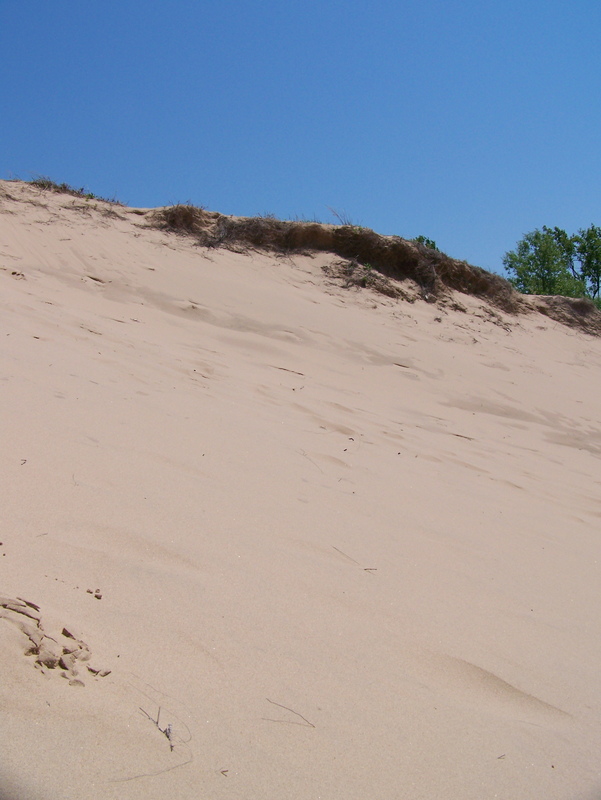 When Caitlin first suggested visiting sand dunes along the coast of Lake Michigan, I was super excited. I was so excited not only because they were something new to me, but I would be heading to Colorado’s Great Sand Dunes National Park with Jon in June. And next Thursday I should be spending the night camping out on the dunes. But I’m getting ahead of myself. I visited Caitlin in Kalamazoo, Mich., for Memorial Day weekend, and with all sorts of dunes not too far away on the coast of the lake, we knew that’s where we should head for a day. We decided to go to Saugatuck, a cute town selected this past fall as one of Budget Travel’s coolest small towns. One of the other selections was Bandon, Ore., south of the sand dunes there, but also on the coast with an impressive selection of sea stacks. With a mistake made in the driving, that fortunately did not set us too far off course, we headed to Saugatuck Dunes State Park first. 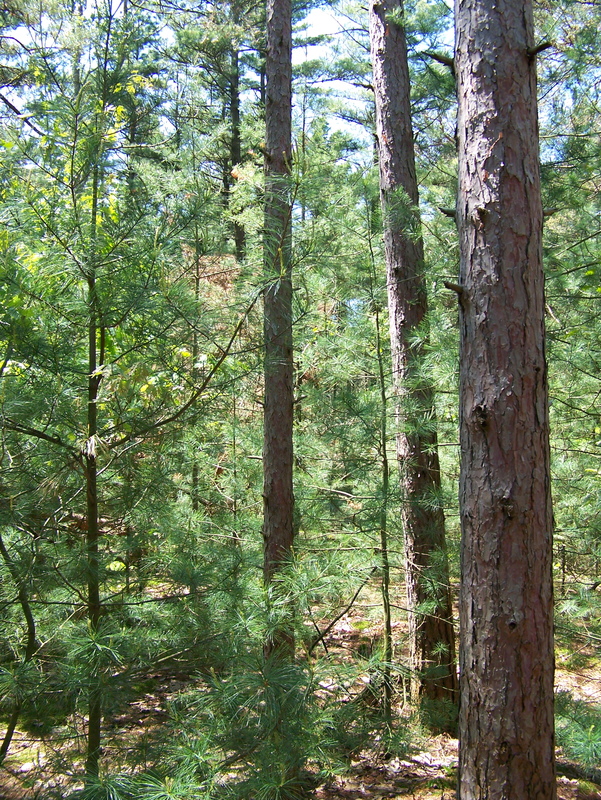 This mistake paid off, because we beat the crowds of Saugatuck’s Oval Beach and instead, took a beautiful hike through a coastal evergreen grove. We chose the longest path to the beach, which fortunately led us to one of the tallest, if not the tallest dune in the park. 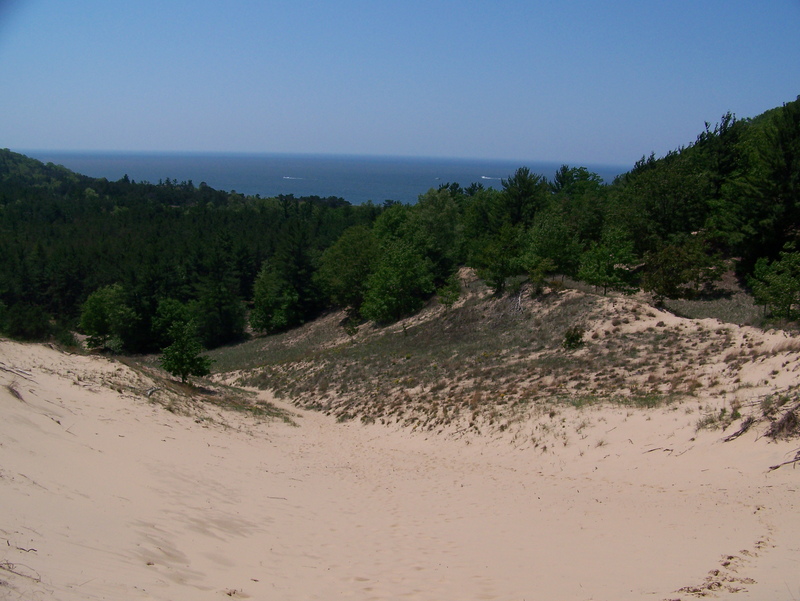 The tallest dune was listed at over 200 feet, and I think this could have been it. Climbing the dune was not as difficult as I thought. I will probably change my mind about that when trying to climb a 700-foot dune or even a couple of 200-foot dunes in a row next week at Great Sand Dunes. The view from above was pretty fantastic, and we could finally see Lake Michigan, as well. After admiring the view and after being stung by enough grains of sand, we decided to head down to the beach. 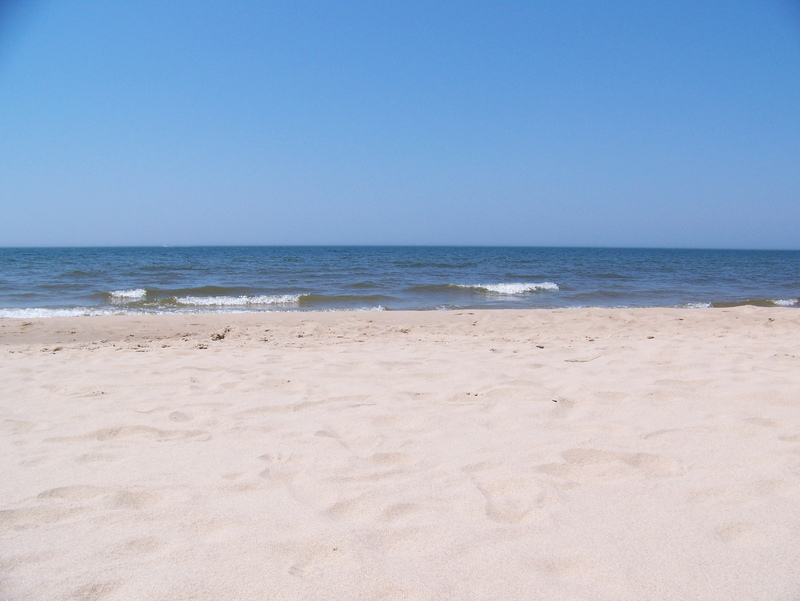 And finally, the beach: The water was frigid, but nice, and I didn’t notice much of a smell. 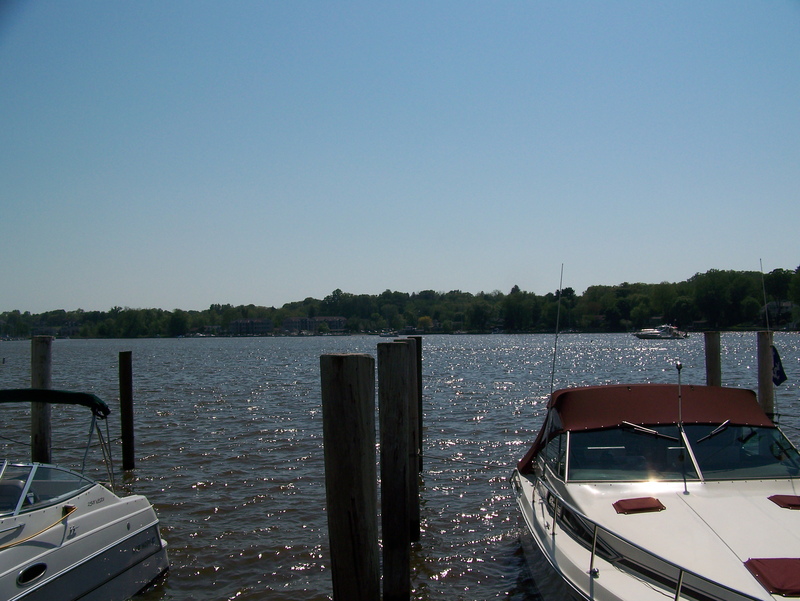 After a while hanging out on the beach, we decided it was time to head back to the car and to Saugatuck, to check out the town and grab a bite to eat at the English pub, Chequers. We walked through some stores and up and down most of the streets, and I quickly remembered how I am not very good at browsing. I am quite good at looking at arts and crafts and gag gifts, and did purchase a couple of handicrafts from South America along with bacon-flavored mints (Mom, don’t tell!) for my brother. I had my eye on a table runner, but nearly always talk myself out of buying furnishings, especially now with plans to move. After a tasty, but expensive ice cream from Kilwin’s, we headed back to Kalamazoo, which ended our wonderful Memorial Day at the beach. This entry was posted in North America, Photos, Travel Narrative, U.S. and tagged Art, Beach, Food, Hiking, Ice cream, Michigan, Pacific Coast Highway, Photos, Sand dunes, State parks, Travel. Bookmark the permalink. The Pacific Coast Highway is a beautiful road to travel. 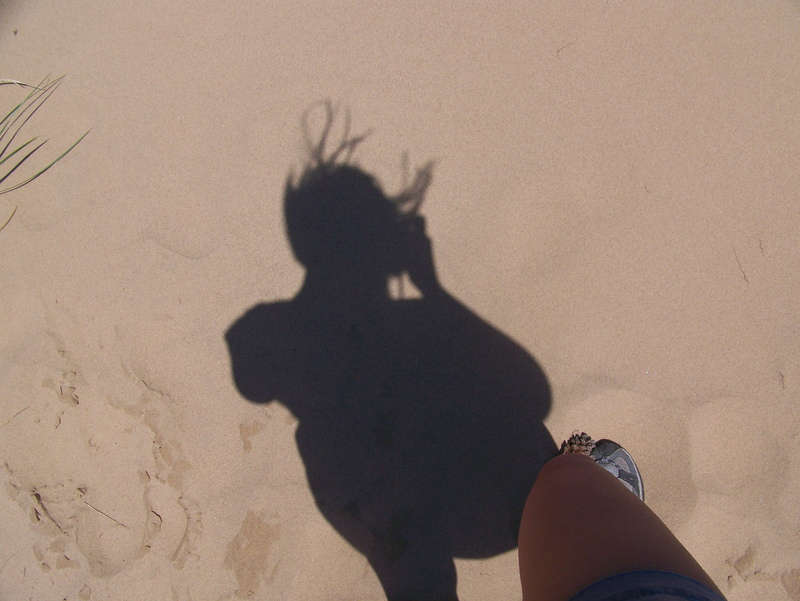 Sand dunes are a blast to roll around in, brings me back to my childhood. Yes, I really enjoyed driving the Pacific Coast Highway. We drove from San Francisco north to Tillamook. I can’t wait to experience the dunes in Colorado.